This year I was counting my blessings as we made it through May with no tornadoes in Clay County and no Memorial Day storms! Yet history seems to repeat itself on days. Last year, hail went through the counties north of us on June 3. 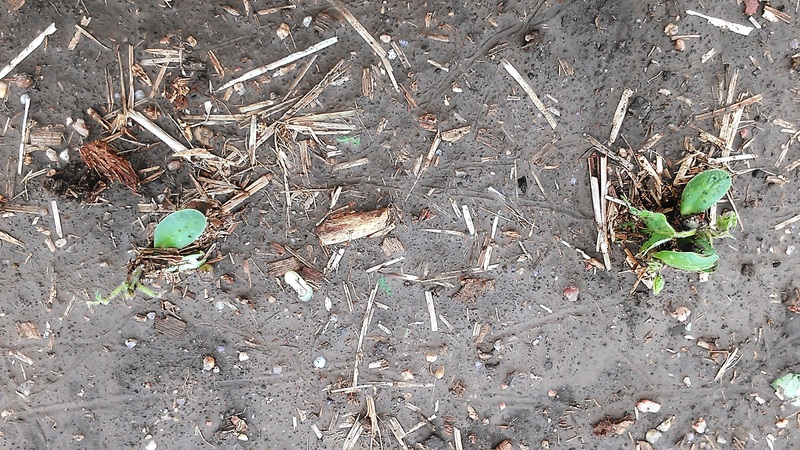 This year, hail hit us on June 3rd….an estimated 30% of Clay County. Please also see the resources listed at the end of this post for more specific information regarding decision-making. 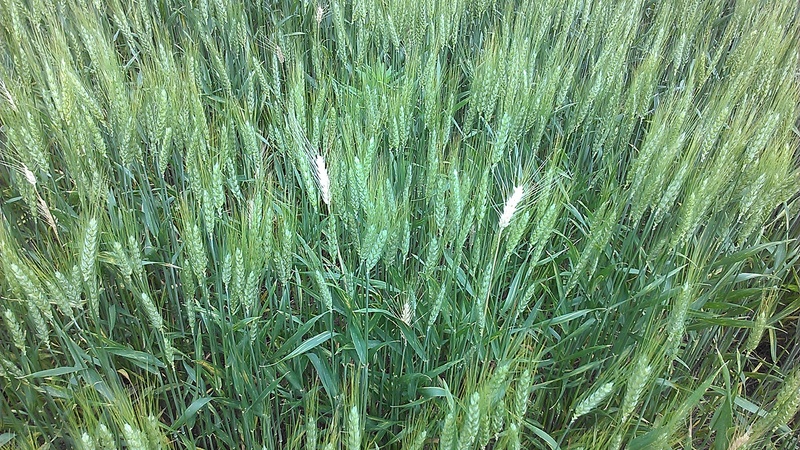 Earlier that day, I had looked at wheat in a number of counties where white heads were appearing in wheat. Most often they easily pulled from the head and weren’t more than 2% of fields. Those were attributed to wheat stem maggot. The white heads that were hard to pull from the stem were most likely due to some late frosts that we had in the area. The evening of June 3rd resulted in various rainfall totals throughout the county and hail damage to an estimated 30% of the County. This photo is of the west fork of the Upper Big Blue River that was flooding many fields along Hwy 6 between Hwy 14 and Sutton. 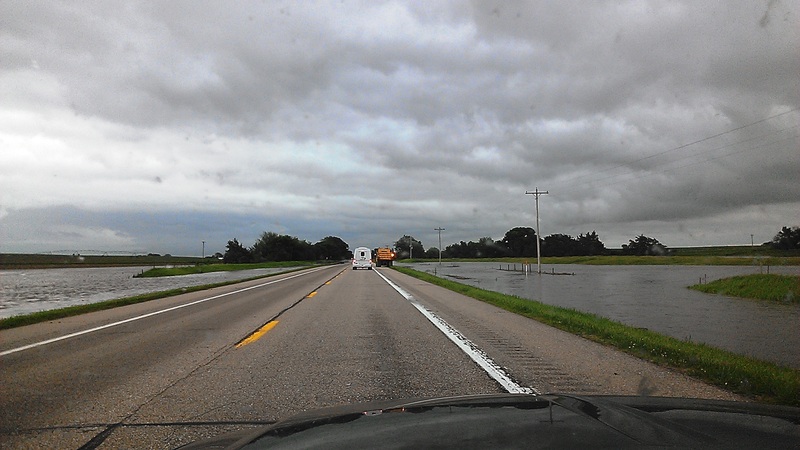 This was June 4: Water along both sides of Hwy 6 from Hwy 14 to Sutton and over the road in a few areas. The road was closed on June 5th after another 3-4 inches fell in the area Thursday night. 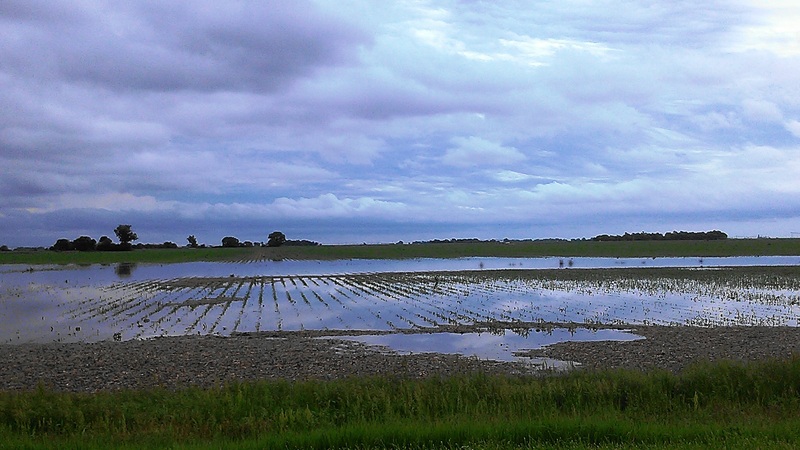 Portions of fields were flooded throughout the County and we’ll have to see how long it takes for water to recede and what temperatures do to determine any replant situations. 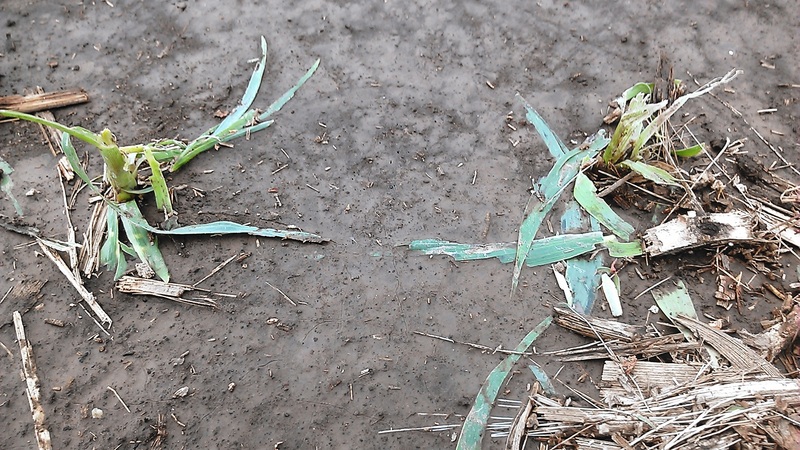 Corn in the V5-V6 stage ranges in hail damage. The worst damage of plants were reduced to sticks. Time will tell how well the plants recover. I’m concerned about bacterial diseases in corn-particularly Goss’ wilt showing up later…but also a bacterial rot that we were seeing in Nuckolls and Thayer Co. after the heavy rains they received last month. Soybeans ranged from planted to V3 in the County. Many of the hail-damaged beans still had a cotyledon attached. In the past, I’ve seen new plumules shoot from the top of the stem when the growing point wasn’t too damaged. We again will need to wait and see what happens. First cutting alfalfa is down in much of the County waiting to be baled. Severely hailed wheat field. You can also see the amount of stripe rust present in this field. We estimated 75-80% of wheat heads in this field were broken over and wouldn’t fill the heads. 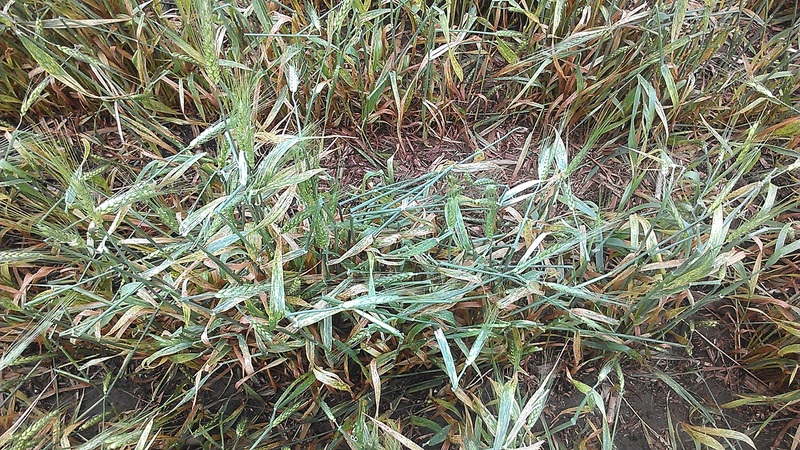 Another hail-damaged wheat photo. 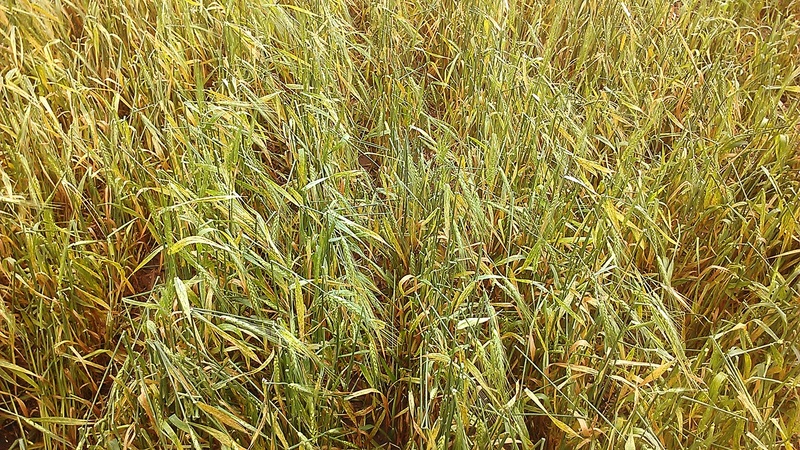 We have a great deal of stripe rust of wheat in the County and some farmers with livestock have chosen to hay wheat that is severely affected by stripe rust. Some did spray fungicide which has held the rust back. Others are going to just see what happens yield-wise. 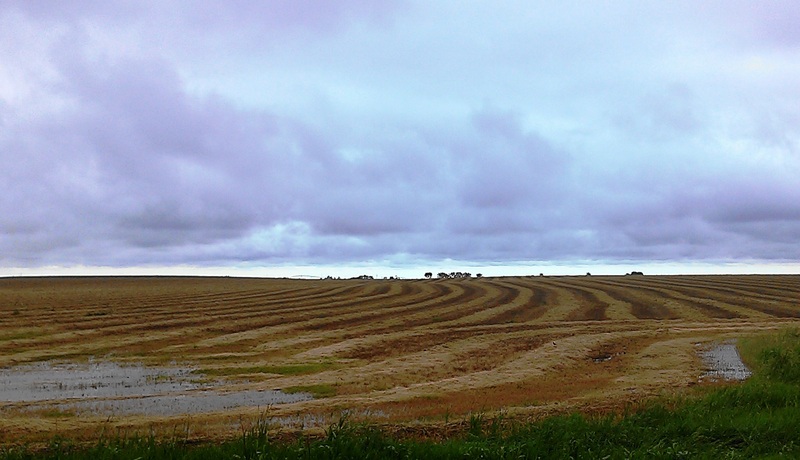 Posted on June 5, 2015, in Crop Updates, Storm Damage and tagged Agriculture, corn, crop update, Crops, Extension, farm, farming, flood damage, hail, hail damage, replant, soybean, wheat. Bookmark the permalink. Leave a comment.